I normally don’t make it to Gourmet Yarn Co. very often. It’s way on the other side of town and there are 2 other shops that are closer to home. So usually I will just stop in if I happen to be on that side of town, like when I have a Drs. appointment. Saturday, I met friend Ann for lunch close to GYC so we stopped in to pick yarn for projects we had planned. I didn’t have the pattern for the Celtic Tote with me, but was sure I could get what I needed. That’s where my trouble began. There was some Plymouth Tweed in a charcoal color that I really liked. I think the tweed will look really good when it is felted. It was about the right guage and there was 109 yds per skein, which sounded right. So I bought 3 skeins. Also found some di.ve Autunno in a pink/orange colorway that would go with the reddish brown one I already have, and a set of HiyaHiya stainless double points. When I got home I went in to check the tote pattern and discovered that the yarn they used had 190 yards, not 109. So I got on the phone real fast and asked if they would please hold 2 more skeins for me. Needless to say I made another trip across town on Sunday to pick up the yarn that was being held and an extra skein for good measure. So I went to Gourmet Yarn Co. twice in two days. A new record for me. 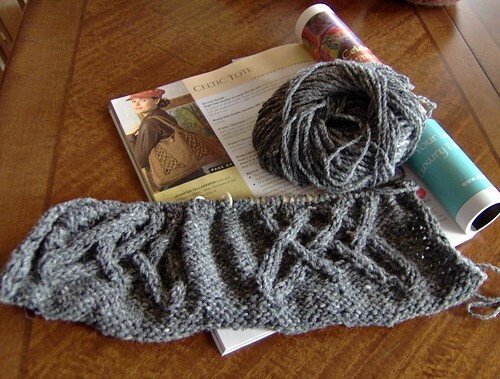 Sunday afternoon I cast on for the Celtic Tote, from the winter issue of Interweave Knits. It took a couple of tries before I got it right, but the third time was the charm. Here is my progress so far. I’m a slow knitter and the cables are pretty intricate which makes for a slow knit also. Lots of counting. I really need to get some quilt work done, but since Thanksgiving, my back has been in spasms. For the most part it is just annoying, but I can’t sit at the sewing machine and use the foot pedal. I’m supposed to be passing Ann’s blocks on to Colleen. Hopefully I can finish them soon. Kerry came down for a visit yesterday. We had planned on going to a mexican restaurant for lunch, but after talking about things we would like to someday do and see, we ended up here. Pops carries a selection of 400+ ice-cold sodas and sparkling waters from around the world. The food in the restaurant is good, but seating is limited. So I would recommend visiting in the off hours if you’re in the area. Of course you can shop the bottled sodas and souvenirs anytime. We had a good time and will definitely visit again. Just down Rt 66 from Pops, is the historic Round Barn of Arcadia. The round barn was built in 1898. 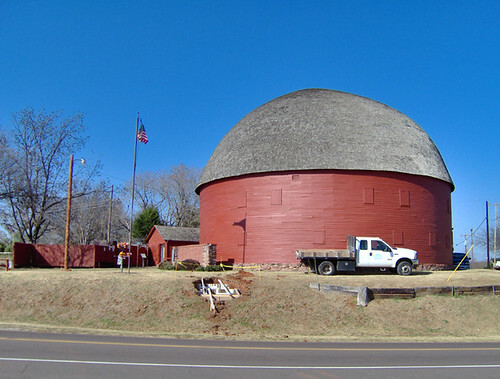 It is the only truly “round” barn (most are actually hexagonal or octagonal), the Barn is 60′ in diameter, 45′ in height and is two stories high. The upstairs loft has a wooden floor and an architecturally impressive ceiling. 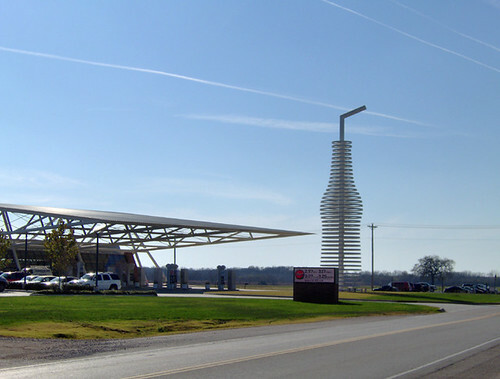 The structure was designed with the notion that being round would help it withstand Oklahoma’s tornadic conditions. Not sure if it is scientifically accurate, but the barn has been standing for almost 110 years. I’ve been working on various projects but don’t have anything to really show for it. I do have a progress pic of the September Woods socks. I’ve turned the heel and now I’m doing the gusset decreases. I am hosting the Thanksgiving meal tomorrow, so I better get busy straightening the house and baking pie. I don’t have anything to blog about. 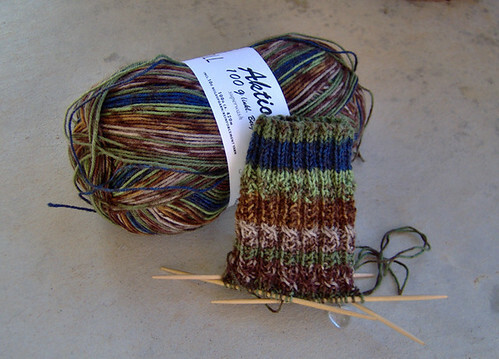 Just wanted to post a better picture of the stitch pattern in the September Woods socks. I used my homemade sock stretcher to open up the stitches on the cuff so they can be seen better. I can’t believe I’ve been blogging and boring a few people for an entire year. Time does fly by. There has been some knitting done around here. I finished the “Coronet” hat. It was an easy knit. The only problem was with casting on the hat body stitches around the band. The instructions weren’t clear which stitches you were to be casting on through. I tried it a couple of different ways and wasn’t entirely happy with either of them. If I make another hat I may try slipping the first stitch on the right side of the band and see if that makes it easier to pick up the stitches. Needles – Size 8 circulars and dpns. 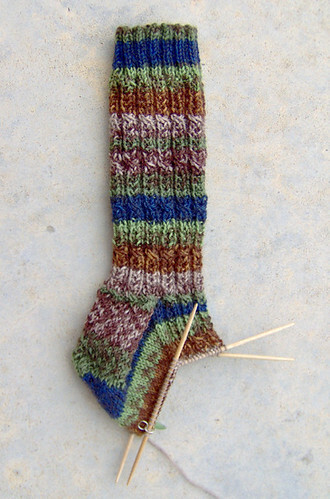 Then I found a sock pattern that I thought would knit up well with self striping yarn. The design will give a little interest to the socks without getting totally lost. 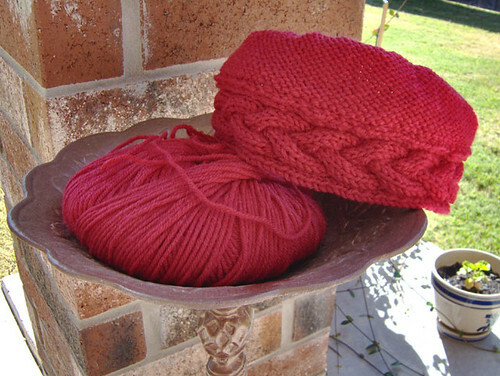 I’m calling them “September Woods”, because the yarn reminds me of the woods and the color name is “September”. I went to Lawton last Saturday for Skrappies Workday. I didn’t accomplish much besides talking, eating and frogging a sock, casting back on and knitting the cuff ribbing. 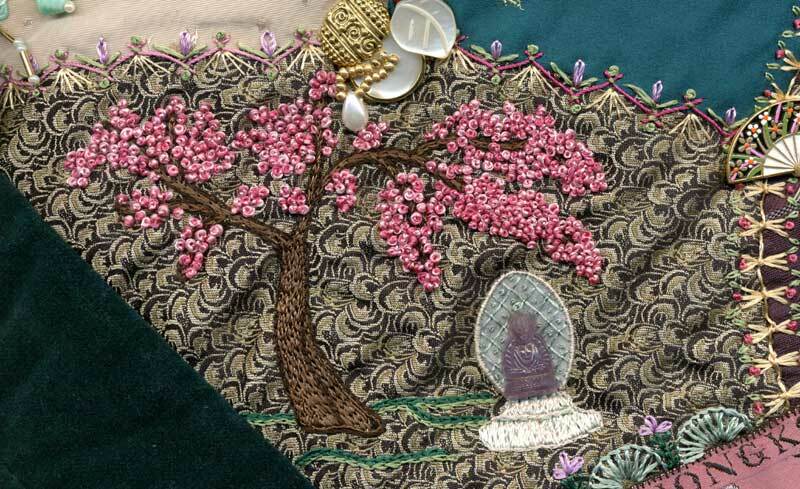 My friend Sharron invited me over afterward to relieve her of some “inherited” needlework supplies. She was really generous and a great big THANK YOU goes out to her. I am now the owner of probably every color of DMC floss ever produced, 2 or 3 times over plus lots of perle cotton. Mill Hill beads and treasures, there’s even a tiny sheep. Going through the boxes I brought home is like a little treasure hunt. There were a lot of knitting needles, but they were all aluminum so I didn’t take any of those, they make my hands ache. I did get several stitch holders and enough white, pink and burgundy Bernat acrylic yarn to knit an afghan. From the swatch in with the yarn it looks like the previous owner was starting a Feather and Fan afghan. The weather lately has been strange. Here it is November 13 and we haven’t had a freeze yet. I have a Hosta that decided to bloom, even though it’s leaves are yellowing from the cool weather. My geraniums think it’s spring. The tomatoes plants are loaded and I need to pick the ripe ones, also have 4 little baby eggplants. I’ve made a little more progress on the Coronet hat. I’ve knit the body of the hat up to the decreases. In the pic below the hat is turned inside out to show the cable band, which folds up when worn. I would have more progress to show on the hat, but I went and cast on another sock. So far I’ve knit the cuff. Now I just have to decide on the pattern of the leg. Where have all the birds gone? I’ve noticed for the past week that there are very few birds in our neighborhood. I haven’t seen any at my feeders. Curious. The Coronet hat. 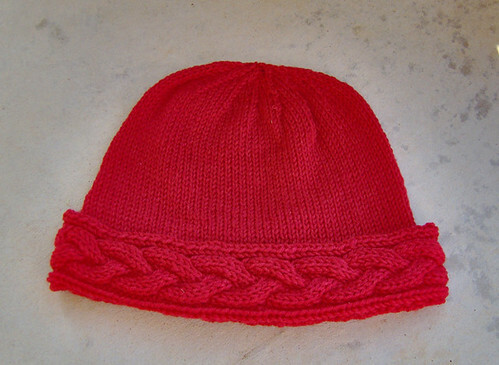 I finished knitting the cable band, joined ends and cast on stitches for the body of the hat. 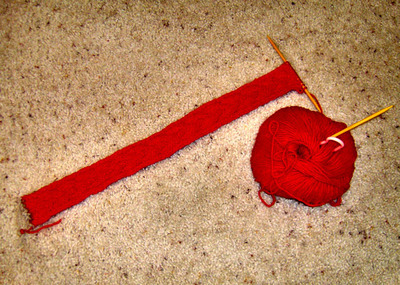 Knit approximately ½ of the body of the hat. I had to Kitchener the two ends of the cable band together and did it in the cable pattern. I’m proud to say that except for one small spot on the edge (I got a knot) it’s hard to tell where the join is. Below is a very bad picture of the band in progress. I hope to have a good pic tomorrow of the hat knitting so far.